CP&E Evaluation is be used throughout the world, including: Australia, Brazil, Canada, Ethiopia, Finland, Israel, Japan, Mexico, Nepal, New Zealand, South Africa, Spain, the United Kingdom, and the United States. In addition to this AEA website, we have a number of blogs and websites containing a vast array of useful tools and information (see below). As developments in the field unfold, they are reflected in these web pages. 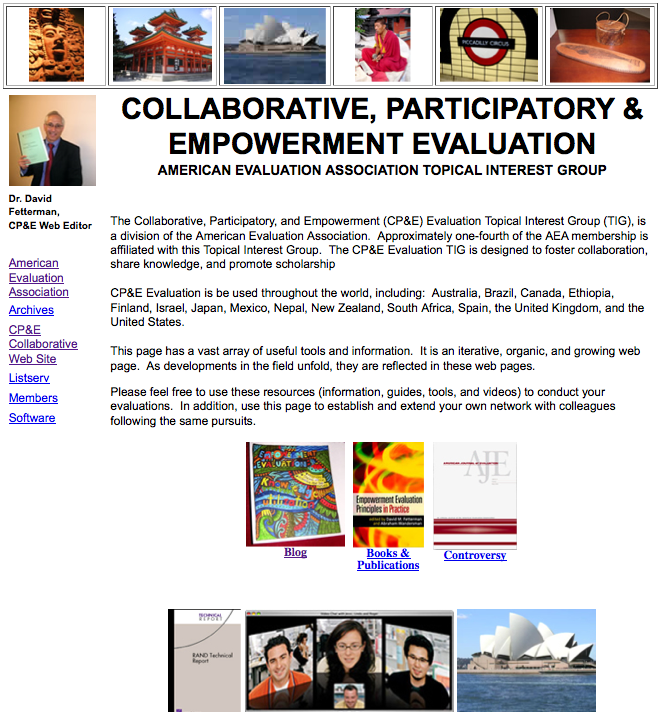 This one is designed to keep colleagues up-to-date on AEA related CP&EE activities. Our blogs also focus on online videoconferencing, digital file sharing - Picasa, and related blogging tools in evaluation. 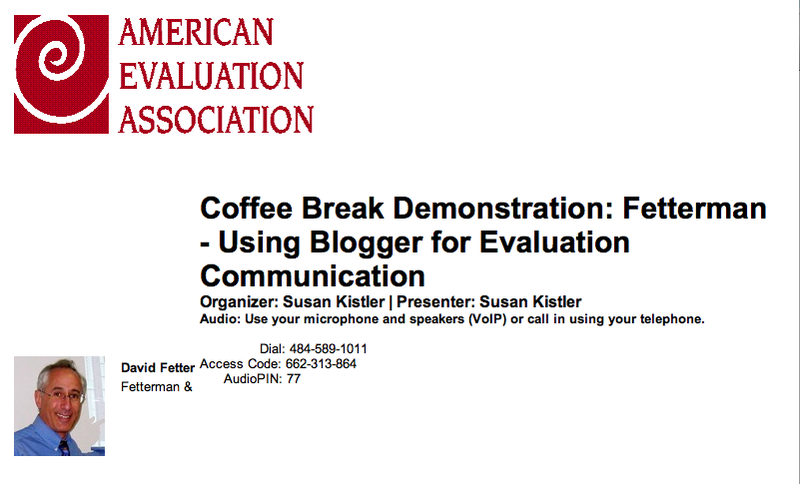 We hosted an AEA Coffee Break Demonstration or Webinar on Blogging. It was on March 4th from 2:00 to 2:20 pm (EST). It was titled: Using Blogger for Evaluation Evaluation. Description: Blogging is free, easy to use technology to assist you in evaluation. It has the look of a web page, but is more dynamic and invites comments and exchanges. Instead of being used to talk about yourself, blogging can be used to report about your evaluation. 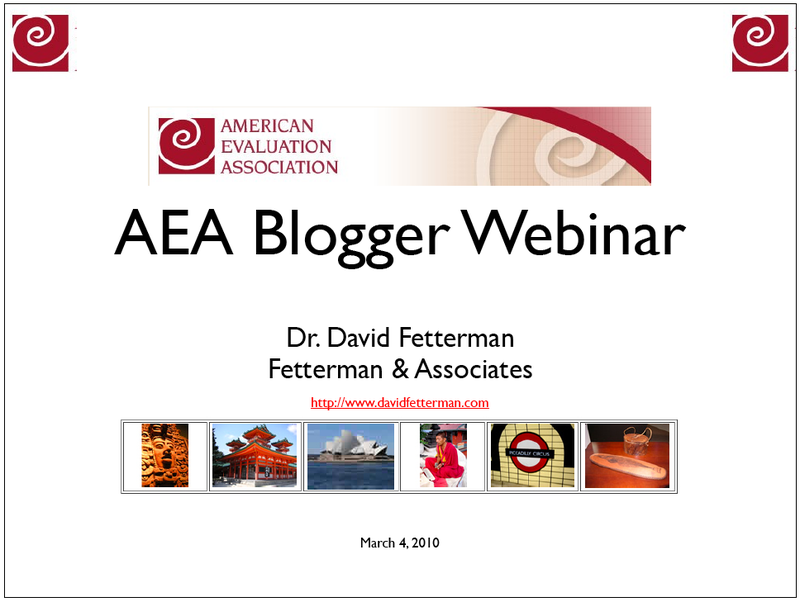 Using Blogger, a blogging platform, David Fetterman, of Fetterman & Associates, will demonstrate how to set up, format, and post to a blog. 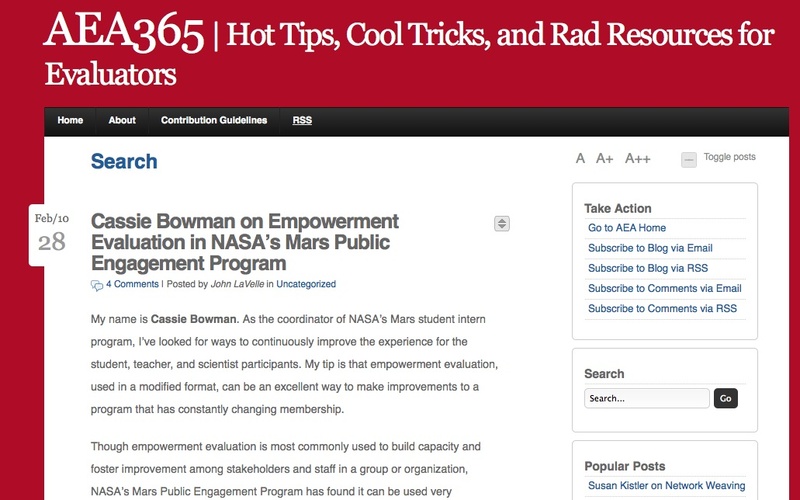 He will also show examples of blogs being used as part of evaluation practice. Slides of Webinar: Available in the AEA elibrary and here. 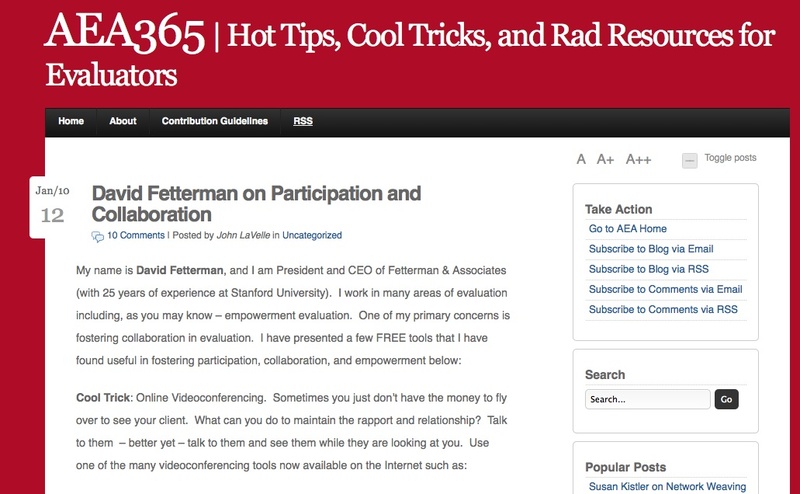 Video of Webinar: Available in the AEA elibrary. You will see an announcement shortly about our new TIG hosted blog on Google Docs, Spreadsheets, and Collaborative Web Sites. We will discuss how these tools can be used to invite collaboration with program participants, staff members, and funders. It is a virtual space to create and extend evaluative discourse. We have an example you can look at right now. 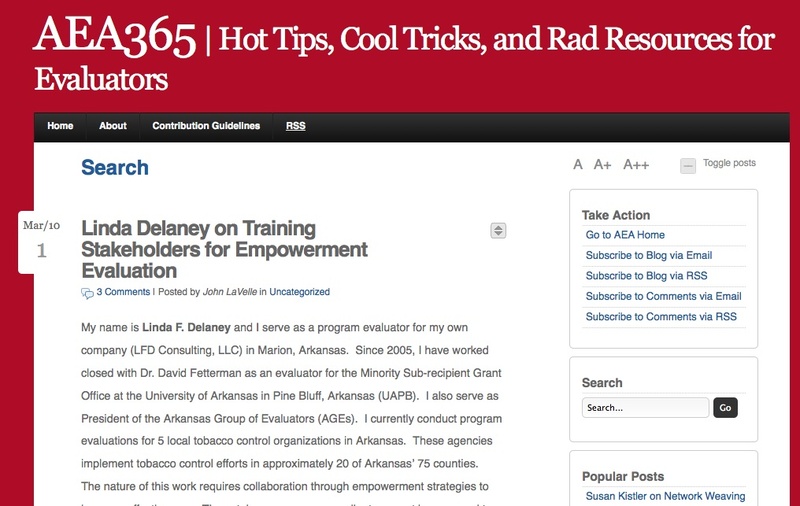 It is the Arkansas Tobacco Prevention Empowerment Evaluation. We also have one for the Collaborative, Participatory, and Empowerment Evaluation TIG. So look for the upcoming announcement and join in our webinars and blogs. We also have our own highly used web site. It is designed to support the communities both within AEA and outside of our organization. Please join us and take a look at the wealth of resources we have built up for you - ranging from free guides to free tech tools to make your evaluation more powerful, accurate, and meaningful, (while building capacity in the process). You thought we were done right? 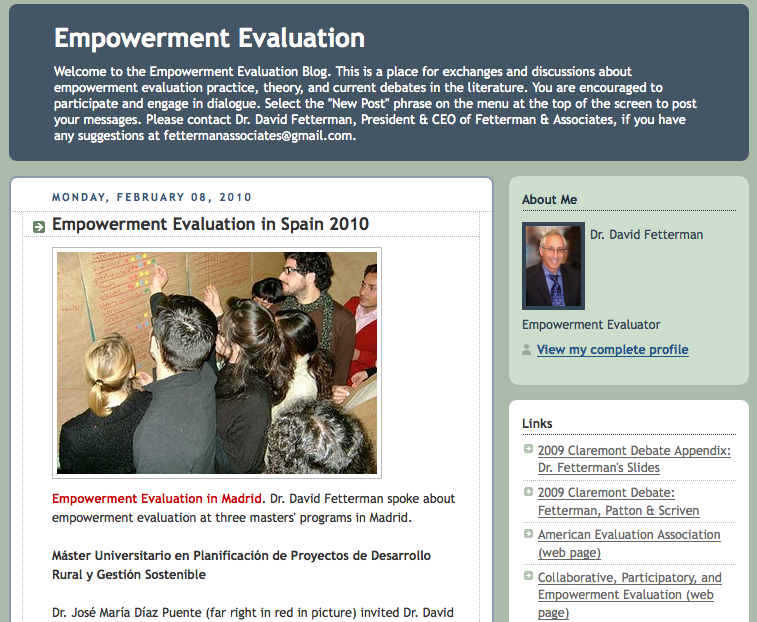 Well we also have an Empowerment Evaluation Blog with updates on empowerment evaluation activities, including international projects, domestic training opportunities, and awards. 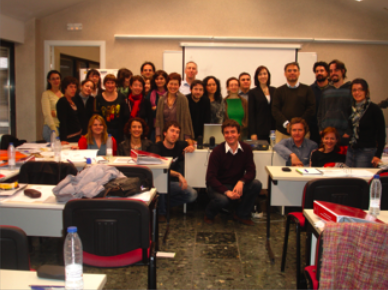 Liliana Rodriguez-Campos, Associate Professor and Director Center for Research, Evaluation, Assessment and Measurement University of South Florida was invited to the Universidad Complutense in Madrid to speak about her new book Collaborative Evaluations. 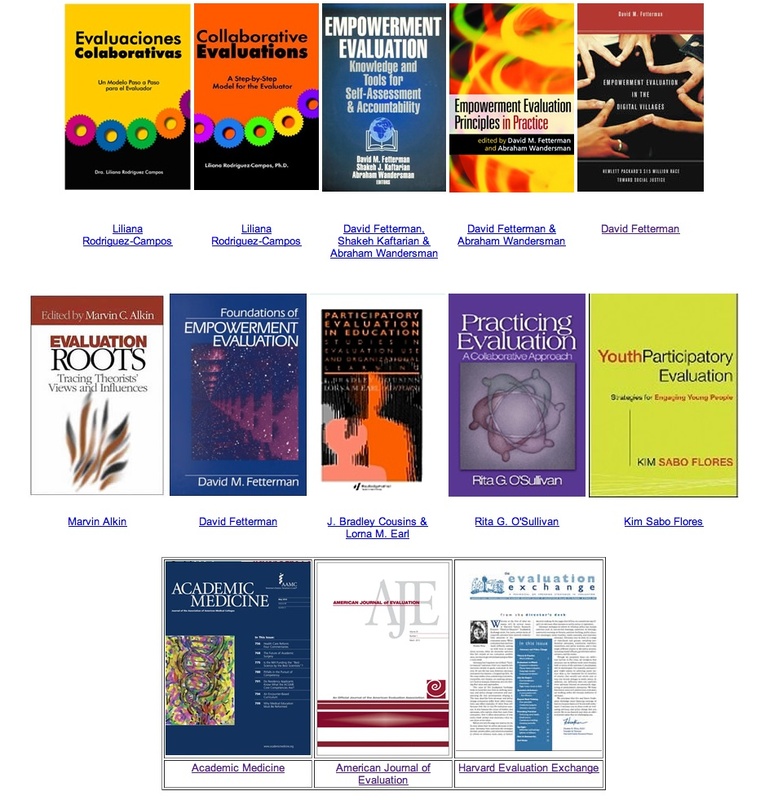 Collaborative Evaluations is a highly comprehensive and easy-to-follow book for those evaluators who want to engage and succeed in collaborative evaluations. 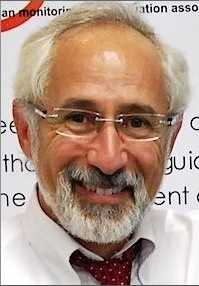 The author presents the Model for Collaborative Evaluations (MCE) with its six major components: (1) identify the situation, (2) clarify the expectations, (3) establish a shared commitment, (4) ensure open communication, (5) encourage best practices, and (6) follow specific guidelines. In clear and simple language, the Dr. Rodriguez-Campos outlines key concepts and methods to help master the mechanics of collaborative evaluations.